I’ve been obsessed with balsamic vinegar lately, adding it to all my meals and binge-eating bread and and balsamic vinegar dip. It’s pretty addictive stuff and adds such a wonderful, unique flavour to things. 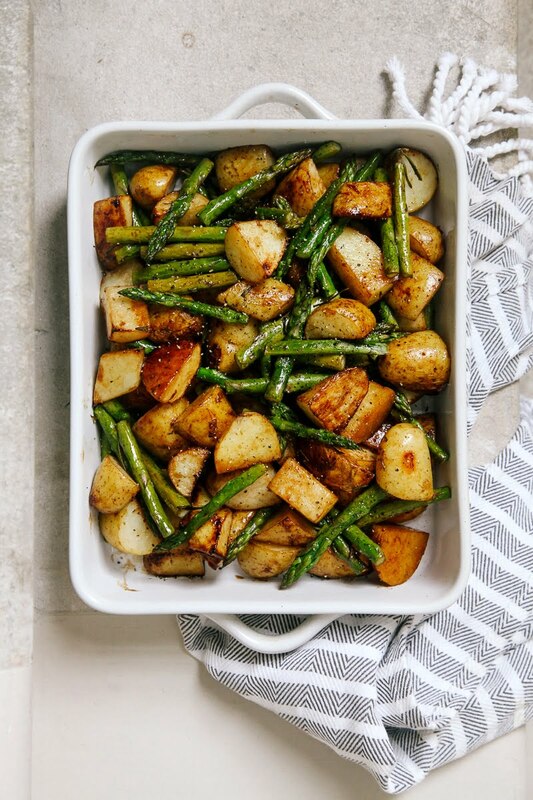 Today’s recipe uses it to bring out the sweetness of seasonal asparagus and give a crisp golden coating to these new potatoes. So flavourful, so moreish and so comforting. 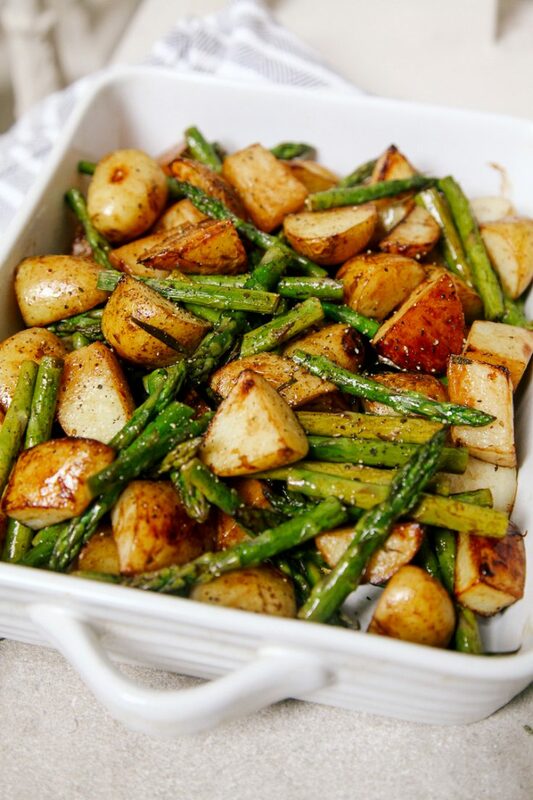 I think this would make the perfect side dish for an Easter lunch or dinner. Or just a simple, casual weeknight dinner in itself. 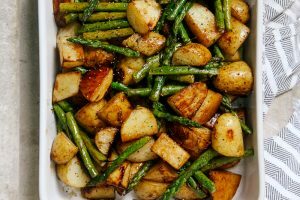 A simple, delicious side dish featuring seasonal asparagus and new potatoes with the subtle sweetness of balsamic vinegar. 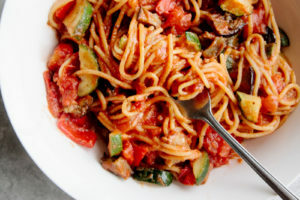 Making this tomorrow along with rib eyes!!! I would like to subscribe without commenting. Okay I made this. I baked it for 30 minutes at 400 degrees instead of 20 minutes. Add the asparagus and baked for 30 minutes more. Then I a single serving in a bowl and put a poached egg on top a little seasoning to taste. OMG this was the most delicious thing I’ve ever had. Wish I could add the picture I took as a tease. This looks delicious! How much is a serving? Yum! I am such a fan of this recipe. Love all of your recipes and I always enjoy them. This is my favorite and my go to meal. So delicious! 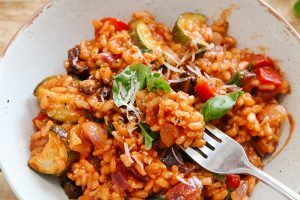 Trying this tonight but with green beans! 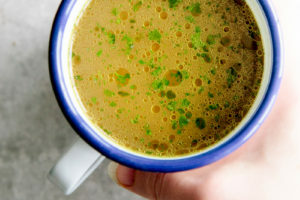 It smells delicious and my kids are looking forward to trying it too! 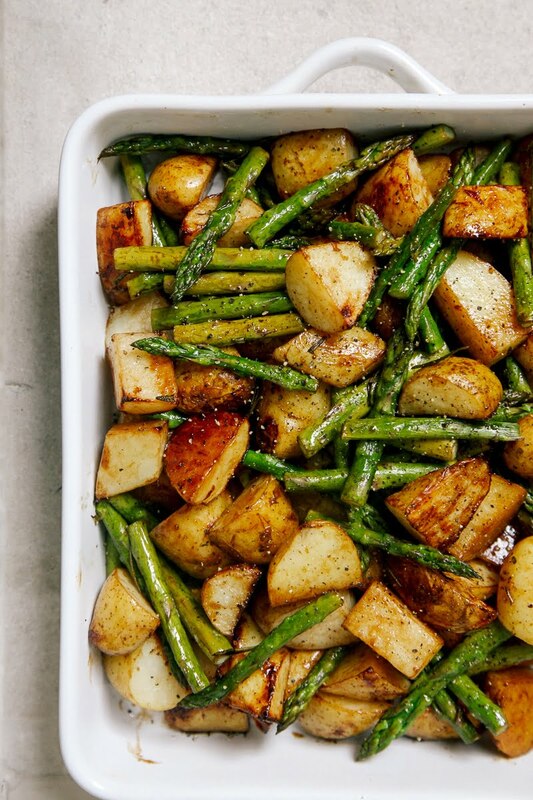 I don't know why I've never thought to roast asparagus and potatoes together! Delicious! Loved it!! But yes, potatoes need to be cooked longer. DI you know how many calories this meal is?? This was super delicious! Only the i did different was boiled my potatoes for 15 min before putting them in the oven because i like them soft. Its definitely a winning recipe! Took the suggestions here to heart and this was freaking awesome! parboiled regular Idaho potatoes, crush 3 cloves real garlic in to my oil, combined the oils/garlic and let sit for maybe 15 minutes. 10 mins in the oven - amazing! Would the white balsamic work or must I use the dark???? I love potatoes with garlic. I'll have to try this with the balsamic. It looks delicious. Looking forward to trying this dish. I'm planning on lamb as the main course. I'm going to surprise my wife with this dish. Thanks for sharing. In total agreement. Potatoes needed much longer to cook through. I just found this recipe today. 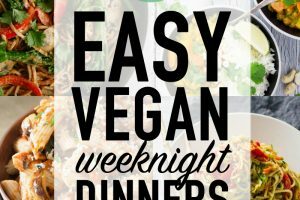 My husband and I are making it tonight! We both love balsamic, but I've never thought to put it on potatoes, weirdly lol! This sounds lovely but I'm struggling to think of something to go with it? Any ideas? I'm made this tonight with Balsamic Honey Mustard pork chops .... Was a great combo! I didn't use new potatoes, I used red potatoes, since they're larger they had to cook a bit longer but I cooked the potatoes while the pork chops were marinating and then added the asparagus when I began to cook the chops. Yummy!!! Grilled ranch chicken. Or dry rubbed chicken legs. Made that combination tonight and it was delicious! I did not have garlic infused olive oil so I made my own. Crushed three cloves of garlic and added to the olive oil allowing the flavors to macerate over a couple hours before using in the recipe. Having a dinner party with nine guest so using three pounds Yukon gold potatoes and a pound of asaparugus. 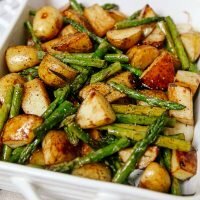 I plan on allowing 40 minutes for potatoes to cook before adding asparagus. I made this and thank you because the taste transported me back to the age of 8 walking back from Brownies with a bag of hot steaming chips wrapped in newspaper. Thank you. Thank you. Thank you! I thoroughly enjoyed it. Sorry that I'm not able to do this on my own but could you convert the potatoe and asparagus amounts to lbs. and ozs. It's equal to about 2.2lbs of potatoes. And about 8.8 ounces of asparagus. You know you could use your phone or your home P.C., to convert...just saying. potatoes red\new (same) 2.2lbs asparagus .5lb oven temp 390 I am going to try this weekend for guests. I will bake pototoes for at least 40 min. before added asparagus. I will also try baking at 375degrees. hi, it was a nice recipe, i tried it this for lunch, alas we ate at 3PM as, potatoes needed one hour and a quarter to be tender huh...i wonder how you manage to make it only 20. Preboiled ?